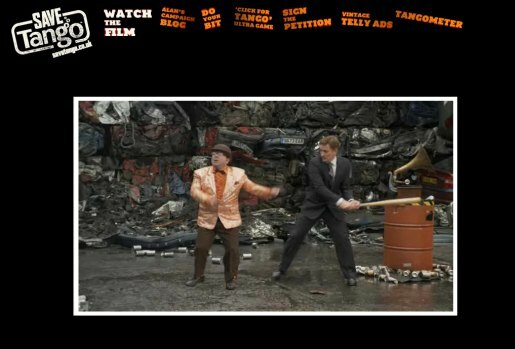 Today’s site of the day is the Save Tango appeal site, savetango.co.uk. Britvic, the owner of the 58 year old brand of carbonated soft drink, is attempting to revitalise the British fan base built around the wacky advertising campaigns of the 1990s. The site is central to an integrated campaign of non-PC silliness, appealing, perhaps, to the people who tried Tango slapping in 1991. The Save Tango site also includes Alan’s campaign blog, , stencils, wallpapers and posters, the Tango Ultra game (keep clicking to get more and more Tango), vintage telly ads, links to the Facebook group, Flickr profile and YouTube channel. Bartle Bogle Hegarty London by creative director Nick Gill and creatives Richard McGrann and Andy Clough, typographer Chris Chapman. Filming was shot by Ben Gregor via Knucklehead, London with producers Lindsay Turnham and Josh Davies.